In September 2003, almost exactly two years after fire bombs reduced the Twin Towers in New York to rubble, the house in Christchurch Alice and I had lived for sixteen years was destroyed by an arsonist. At about 2 am when I was reading in bed I heard crashing sounds from the street nearby but they soon stopped and I did not get up to investigate. Later when I was half asleep I heard an unusual noise and then saw flames outside my bedroom window. I didn’t stop to dress but got out of bed and met Alice in the upstairs hall. We could see smoke coming up the stairs. We immediately went down the fire escape to the Fire Station next door and rang the bell but got no answer. I ran round to the side of the house and woke up our tenants who also left the house. We joined the crowd outside in the road and watched in horror as the flames began to break through the window on the upper floor. The Fire brigade arrived after about ten minutes but it was some time before they brought the fire under control. Kind neighbours gave me some shoes and clothes to put over my pyjamas. Alice and I went to stay with friends until we could get our lives together again. When Alice and I went inside the house next day we discovered the extent of the damage. The house itself was beyond restoration. The downstairs rooms had suffered less than upstairs as the fire had raced up the wide staircase. Alice’s old family player piano was wrecked and smoke has spoiled the spines of my large collection of classical LPs many of which I had obtained at bargain prices when CDs came in. The real damage was upstairs. In the hall our thirty-year collection of art works, including commissioned paintings by our friend Donna Demente, Turkish carpets and all my costumes were destroyed. Alice lost her best clothes, lovingly acquired over the years, all her irreplaceable Latin and Greek texts, Catholic reference books, and the school notes on art she had accumulated. 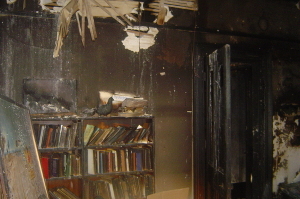 Smoke and water had ruined the thousands of books in the upstairs library. Although we had insured the house and contents there was no way we could replace the treasures we had lost. Insurance on old houses is never enough to cover their true value and we had spent many years restoring the interior of the house with advice from our friends in the House Restorers Group. We had replaced the roof and veranda, built a new fence around the grounds, put in a car park and driveway, restored the big bay window and were half way through the expensive and messy task of completely replacing the sewage system. Alice is an only child and her father had died suddenly in Melbourne a few months before and the fire affected her badly. Who could have started it and why? Was there any good news in this “annus horribilis’! We had regarded with horror the ruining of Victorian heritage homesteads by home owners and developers who subdivided sites and built new houses or apartments in front of them. We had refrained from subdividing our large section even though we could have got rid of our mortgage that way. 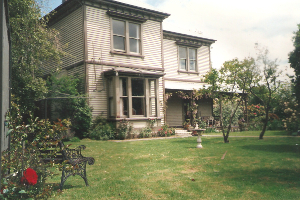 With the house now destroyed we found out that the large section could be sold for good price and together with the insurance on the house we could not only buy another place but also buy a house in Oamaru which we loved and where so many of our friends lived. To her great relief Alice’s widowed mother decided she would come over and buy a suitable house in Christchurch. We found an already well restored more manageable Edwardian villa in Christchurch and a wonderful Arts and Crafts house overlooking the bay in Oamaru. Alice’s mother bought a unit in an excellent retirement village nearby in the centre of town and a house next door to our new place in Oamaru. Another good side to these traumatic events was nation wide concern of the whole population of New Zealand. I had no idea how much they had taken their wizard into their hearts. We were back on our feet but it took years to get back on track again. As for the culprit and his motivation. Fingerprints on the damaged VW lead to the identification of a young man with a psychiatric history, but there was no hard proof that he had also set fire to the house. No apparent motive could be found but it could have been a manslaughter case. World wide catastrophes, like the destruction of the Twin Towers in New York, leave scars on the psyches of hundreds of millions of people. Catastrophes can also happen on a much smaller scale but still leave their mark! The attached videos taken from TVNZ is excellent coverage of our personal catastrophe.